As everything is late and rushed this week, I will report progress on some matters which have been discussed here recently and leave all the big stuff for next weekend's update. In the good news department, I have a brand new uninterruptible power supply for my computer, so, as the remarkably well-preserved Grace Slick sang in 1987, "Nothing's gonna stop us now". You will notice that there has been an additional choice added since the original poll was started. The anti-vaccination liars immediately smelled conspiracy. My reaction was that it made the poll even less scientific and valid than it was before, as the additional choice ("A combination of factors listed above") is effectively a "Don't know" response and therefore is the same as the existing "Not sure" option. Also, if I remember my Introductory Statistics course correctly, you don't change the questions in a survey half-way through and then call it the same survey. The message below is an edited version of something which was posted to a mailing list belonging to the Australian Vaccination Network, Australia's leading anti-vaccination organisation. I have removed information which identifies the writer, but this can be provided if necessary. I feel that you should be aware that a nurse in the children's hospital is not only advising patients not to vaccinate their children and is referring them to very doubtful sources of information, but is laughing at the recommendations made by doctors about vaccination. My view is that anyone working against the health of children has no place in an institution dedicated to children's health. Surely any employee who is actively promoting the lies told by the anti-vaccination campaigners is violating her employment responsibilities and requires a reprimand, if not outright dismissal. We have received information from you with regards to a Registered Nurse who has posted an anti immunisation message to the AVN mailing list. Thank you for this information. We would like to contact this nurse. We appreciate your assistance in providing us with her name. I refer to the email you sent 2nd March, 2005.
thank you for your assistance and attention to this matter. The full moon last week didn't disappoint, and the Gutless Anonymous Liar managed to get to the computer at the GAL Home for the Terminally Useless to post some rants about me to someone's Blog. As usual, all of the fun can be found in The GAL Chronicles. One of the funniest bits was when it accused me of hiding. It made the accusation anonymously! In 1950, atheist Antony Flew wrote Theology and Falsification, which has been described as the most-read philosophical work of the late twentieth century. In 2001, 2003 and again in 2004 it was reported that Flew had recanted and had even converted to Christianity. Such reports came from people of such little faith that they felt the need to distort the views of someone famous. My view is that it would not invalidate Flew's 1950 thoughts if he went mad later. In any case, this is what Sanal Edamaruku of Rationalist International had to say about Flew's "conversion". During the conversation with me, Professor Antony Flew expressed desire to publicise this paper as it represented his views till this moment. "There is no change", Professor Antony Flew asserted. "Some people argue that I changed my views. It is simply not correct." As part of writing the piece above, I did some research on the 'net on Madalyn Murray O'Hair. I wanted to check some facts (including the spelling of her name, which seems to be "O'Hare" in many places), because I hadn't thought about her for some time. After doing the research I went out to dinner with some friends. I told them I wanted to be home in time to watch Law & Order: Criminal Intent, which is one of the few things I religiously (if I can use that word) watch on television. I had not looked at the program guide, so I had no idea what this particular episode would be about. It was the episode named "Eosphoros" (Series 4 Episode E5401), and it dealt with the case of the leader of an atheist organisation who was kidnapped with some members of her family and murdered as part of a plot to steal money from the organisation. At one point it was mentioned that the woman had made many enemies when she was active in the campaign to stop prayers in schools. The story seemed vary familiar. Spooky, isn't it? The whine from the AntiBio executive encouraged me to strengthen the language in my own complaints policy. I have updated the policy and complainers should now be in no doubt about what will happen. That is, if they bother to read the "About this site" page, which they never do. My ISP and I receive the occasional complaint about this site, and I suppose I would be disappointed if this were not so. Anonymous complaints are ridiculed, laughed at, mocked and ignored. Complaints from real people are read, filed, published on this site and ignored unless evidence is offered of inaccuracy in something appearing on the site. Letters from lawyers (there has only been a very small number of these) are photocopied, read, filed, published on this site and ignored, again unless evidence is offered of inaccuracy in something appearing on the site. Details of Cease & Desist orders or any other requests by lawyers for the removal of content from this site are submitted to the Chilling Effect Clearinghouse. I could not ignore a court order, just as I could not ignore winning $20 million in the lottery (a much more likely event). Of course, anyone initiating court action would not want to have have called me rude names, used twenty different identities, pretended to be me or threatened to harass my clients, otherwise they might look a bit foolish to the judge. I have no desire to publish inaccuracies, but unless it can be demonstrated that something is clearly in error material will only be removed from this site upon the direct instructions of a court having proper and enforceable jurisdiction. Please note that the policy here is to NEVER settle without going to court, and any legal action will be given wide and embarrassing publicity. Do not threaten legal action in the hope of getting a reaction favourable to you in advance of court proceedings or you will be disappointed. People who want to waste their time complaining to government regulatory authorities about The Millenium Project should contact the Australian Communications and Media Authority. Details can be found under the heading "Online services content regulation". Nobody has threatened to sue me for several months. I must be doing something wrong. I promise to try harder in the next few months. You can click here to be reminded of past threats and their resolution. In January 2004, Alynda Brown, SkeptoBear and I travelled a long way to represent Australian Skeptics at James Randi's Amazing Meeting. The story can finally be told, and will be serialised here over the next few weeks. You can read the first chapter here. In their latest episode of commercial stupidity, McDonalds in Australia have taken on an amateur football team. The team is sponsored by a local solicitor named Malcolm McBratney, and the teams have "McBrat" emblazoned across the back of their uniforms. McDonalds have claimed that this is a breach of their trademark rights because everything starting with "Mc" or "Mac" belongs to them. (It should be an interesting fight, because Mr McBratney's specialty is intellectual property law.) Apparently they think that there is some confusion in the public mind between rugby union and hamburgers. Perhaps they are right. Whenever the forwards pack down for a scrum the spectators will think "What a pack of arses", which will immediately remind them of the idiots at McDonalds headquarters. Last year I had an exchange of emails with Professor Boyd Haley, chair of the Department of Chemistry at the University of Kentucky, in which he demonstrated either that he had forgotten a lot of chemistry or the U of K should have a close look at both its recruitment and tenure policies. Put bluntly, the man talks nonsense and appears to be confused about the difference between different chemical compounds and even between compounds and their component elements. He is, of course, loved by both the anti-vaccination liars and the anti-amalgam fools because he says bad things about mercury. It now seems that Dr Haley has a challenger in the mad scientist field, and a paper written by someone who describes himself as "Independent Chemist, M.Sc., retired 08.06.2003. Speciality: Amalgam and Chronic Diseases" has been thrown into the mix. Apparently this paper was peer-reviewed (it must be true - it says so in the paper) and was presented to Representative Dan Burton's crazy anti-mercury witch hunt hearings. A statement from the paper bears closer analysis: "[amalgam] is highly unstable above the melting point of Hg, 39°C". When it was pointed out to the person quoting the paper that this was obvious nonsense, the response was to quote another anti-amalgam paper which said of mercury: "Physical properties are: melting point 39°C, boiling point 357°C". Now, leaving out the minus sign is a mistake, but when the mistake is identified and the response is to give the same answer then stupidity and obtuseness can be assumed. It might be different if this wasn't a case where it is so easy to demonstrate the truth, but when I said that the temperature inside a human body is about 37°C and this was obviously above the melting point of mercury I was asked what qualifications I had to challenge the opinions of professional chemists. I doubted that my reply, "high school chemistry", would be considered satisfactory, and I was proved correct because the response was to ask the question again and repeat the original nonsense (plus some nonsense from Dr Haley about how dangerous mercury is, as if that was going to convince me that I was wrong about the melting point of mercury). Yet again the supporters of non-medicine exhibit their lack of faith. Their heroes and authority figures (even anonymous ones) are not allowed to be anything except perfect, and any attempt to correct mistakes threatens the house of cards. What is so hard about saying "Oops! I was wrong"? Scientists do it every day. I just thought - maybe the ban on thermometers containing mercury was because the mercury in them froze when they were put in people's mouths, making the readings suspect. No, that couldn't be right, could it? This is from an anti-vaccination liar mailing list. I thought I had heard every possible sort of idiocy that these people could come up with, but they are more inventive than I could ever imagine. I just got some rather sad news. I just heard from an old friend (I have not seen for several years) whose daughter was diagnosed with autism (when she was about 1-1/2). Now she is almost three. Their daughter was severely autistic at birth. They were conservative with her vaccinations especially as it became apparent that something was wrong. I quizzed her about her pregnancy -- no shots. I then remembered her husband was a doctor. As it turns out, her husband (a psychiatrist at a county hospital) was required to have a HEP B shot. It was just before their daughter was conceived in 2001. It never dawned on me, but I wonder if the father's having received mercury in a shot before conception could affect the baby? It probably can. They do not know if there was thimerasol in the HEP B vaccine -- but it makes me wonder. In January 2004, Alynda Brown, SkeptoBear and I travelled a long way to represent Australian Skeptics at James Randi's Amazing Meeting. The story can finally be told, and will be serialised here over the next few weeks. You can read the second chapter here. ...McDonalds had long before registered the name McBrat for whatever reason and the issue came up when the team tried to claim this already registered name. A spokesperson for McDonalds is quoted as saying that they didn't mind the team using the McBrats name on their shirts, they just couldn't register it. When I saw this my first thought was that if this were true then there was no story. This was "dog bites man", not "man bites dog". I like things on this site to be correct, so I decided to check with IP Australia where the register of all Australian trademarks is available. To not much surprise I found that the word "mcbrat" is covered by trademark number 992932 and is owned by McBratney Services Pty Ltd. It was applied for on March 11, 2004, and approved on July 15, 2004. It is currently being opposed, but the records do not say by whom. It covers the use of the word for clothing, footwear and headgear. You can see the full details from the IP Australia register here. I have commented before about the sloppiness of some members of the press and other media. In this case it would have only taken a few minutes to check the facts, but the reporter for the West Australian was too lazy and chose to take the word of one side, even though what was said made little sense. (That side is a large advertiser in the paper, but I am sure that this fact is irrelevant.) As for the "spokesperson for McDonalds", Australia's draconian defamation laws prevent me from too much speculation about why he said something which is not true so the best I can do is to assume that he was "mistaken". Canberra, July 12 - Herbal remedies - the good, the bad and the ugly. A forum discussion at the University of the Third Age. I will be doing the "ugly" part. Canberra, July 13 - Herbal Remedies: History, Heresy and Hereafter. At the National Museum of Australia. Talk at 6:00pm, optional dinner afterwards at 8:00pm. A museum dedicated to the history of Australia might seem like a strange place to discuss herbal and natural medicines, but the Australia we know today only exists because of a natural medicine. The entire 207 years of the development of modern Australia is contingent upon one natural treatment for one disease. The use of natural medicines probably predates even the evolution of modern man (cats can only digest meat, which is why they eat grass to clean their insides out when they are sick). This talk will look at some of the myths about herbal medicine - that a long history of use proves efficacy, that natural is always better - and also how it integrates with, competes with and even conflicts with the reality of medical science. The third day meant business and a trip to not-a-medical-Dr Hulda Clark's Tijuana quackery clinic. The rest of the day contained some disappointments because SkeptoBear could not get his fortune told and also came out on the wrong side of the dress regulations at The Magic Castle in Hollywood. His disappointment was partially overcome by the hilarious memories of watching a certain web site owner trying to explain to a Mexican pharmacist that the Viagra he was buying was a present for his wife who was not the lady he was travelling with but everyone's spouses knew where everybody was so everything was above board. Read more of the serialisation here. Hepatitis B Hepatitis B vaccine Autism caused by the mercury preservative. In any case, babies aren't promiscuous and parents should wait until their children come home and say "Mum, I am planning to become sexually active. Please book me into the doctor for a vaccination". DTPa Diphtheria-tetanus-acellular pertussis infant/child formulation Autism caused by the mercury preservative which used to be in the vaccine but isn't now. The effect is possibly a homeopathic one arising from the manufacturing plants having a memory of the mercury which was once there. dTpa Adult/adolescent formulation diphtheria-tetanus-acellular pertussis vaccine Autism caused by the mercury preservative, although sudden-onset autism in adults getting this vaccine seems to be rare. There is a possibility that a man might cause autism in his children by passing on the damage through his sperm. Hib - 4 dose version Haemophilus influenzae type b (Hib) vaccine PRP-OMP, PRP-T, HbOC (as monovalent or in combination) Probably causes autism, but as nobody has ever heard of the disease it is better to be safe and not vaccinate. Isn't it just a fancy name for the flu? Hib - 3 dose version This is the version of the vaccine recommended for indigenous children living in the bush. Autism rates are lower among these children, which may have something to do with fewer Hib shots, but it is still best to be safe and not vaccinate at all. MMR Autism caused indirectly by the rubella component which causes autism in children whose mothers have been vaccinated before they became pregnant. As congenital rubella is not a problem, women planning to become pregnant should not worry about rubella as it will not make them very sick. MMR Autism caused by the mercury in the preservative which has never been used in the MMR vaccine. VZV Varicella-zoster vaccine Not enough information yet, but as chicken pox is harmless it is best to avoid the risk. 7vPCV 7-valent pneumococcal conjugate vaccine The word "conjugate" might mean "adjuvant" and we all know that "adjuvant" means aluminium and we all know that heavy metals cause autism. 23vPPV 23-valent pneumococcal polysaccharide vaccine Anything with 23 things in it is such an assault on the immune system that it is no wonder that children become autistic, particularly as autism is an auto-immune disease. "Polysaccharide" suggests sugar and Type 1 diabetes is an auto-immune disease, so what more proof is needed? MenCCV Meningococcal C conjugate vaccine Another conjugate vaccine - see above. This is another case where caution is the best approach, as only about twenty people die of this each year and some take more than 24 hours to die. Influenza Influenza vaccine Autism caused by the mercury preservative. dT Adult diphtheria-tetanus vaccine. Autism caused by the mercury preservative. If you had only one day to be a tourist in Los Angeles, where would you go? Wrong choice! SkeptoBear and his companions found places to go which cost less and are much more fun and educational. How big was a mammoth? How expensive can a shirt be? How fancy can a restaurant be and still allow someone to ask for a doggy bag? Forget fun rides. Join SkeptoBear's wild ride, and not a movie star's house in sight. Read the next chapter in the saga here. On January 15 this year, Mr William P O'Neill of the Canadian Cancer Research Group, writing in Gutless Anonymous Liar mode, told me that: "there is nothing to stop us.... the payback has started and you will pay......". As yet, nothing has happened and I haven't had to pay anything. Perhaps this threat was impotent. Speaking of which, I wonder if Mr O'Neill has been able to get any treatment for his sexual disfunction, because he told me once that he needed to use a broom handle. I offered to give him the packet of Viagra which I bought as a souvenir in Tijuana. I don't need it. My good friend Richard Saunders of the Mystery Investigators has a day job as a video producer, and he has put together a DVD containing two talks I have given on the topic of medical quackery. All the tenants on the campus of Northmead Technology Park have joined efforts for this project, with publicity being done through the RatgabsDotCom sites, secure server and credit card processing by Gebesse Computer Consultants, and the Australian Council Against Health Fraud getting all the proceeds. 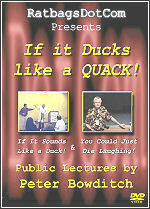 While I am talking about DVDs, The DVD of James Randi's Amazing Meeting 2 from 2004 is available. As well as my presentation there are also talks by Michael Shermer, Bob Park, Phil Plait, Eugenie Scott, Julia Sweeney and others, plus appearances by Penn & Teller, Banachek, Lance Burton and other magicians.